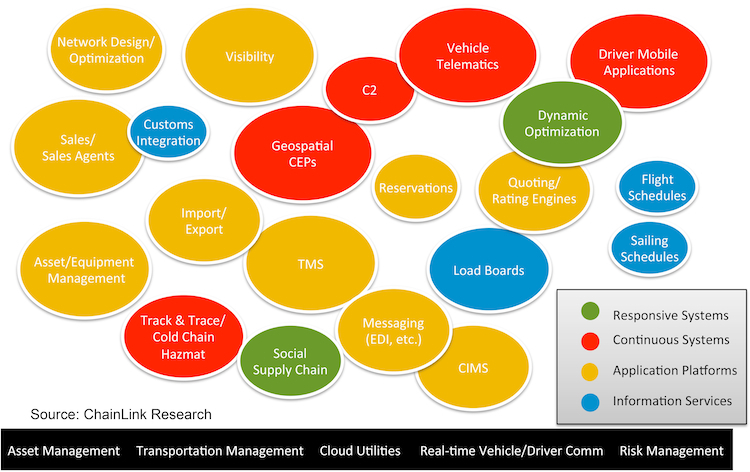 The transportation technology market has an array of offerings, but they are not the same. The TMS sector of the Supply Chain market continues to grow—catalyzed not only by global trade, but also by the expanding strategies and needs of the buyer. In addition, the TMS market is moving forward. New solutions, continued investment in development, and mergers and acquisitions all changed the landscape. In short, it’s time to refresh our concept of what solutions do. So let’s take a look at the technology segments, their characteristics and capabilities, and then talk about solution providers who exemplify these capabilities. Figure 1 identifies the technologies most commonly in use today, and the market that uses them.3 They can be purchased as models or as suites. Larger transportation companies embark on integration projects by blending many best-of-breed components. Software to develop best routes based on business objectives. In logistics, network or lane designs can be based on warehouse/customer locations and the development of preferred networks. Today’s optimization models incorporate variables such as multi-stop, road conditions, fuel efficiency, congestion/traffic avoidance, as well as locating parking for city locations. Systems review long-haul vs. last mile delivery models. The complex world of freight pricing, contracting, auditing, and payment needs software to manage the multi-party agreements, surcharges, commissions, and other line items that pass back and forth between shippers, carriers, and other third-party entities that might be arranging freight movement. Post-delivery audits ensure that the fees adhere to agreements. Large shippers often have third parties manage the freight payment and audit work for them (just as they have third parties manage logistics) due to the complexities involved. Direct sales and sales agent systems to support the solicitation of business for carriers. Proposals, pricing, contracting, CRM systems, and commissions should all be included in the software that supports sales. Software is mode/equipment specific, from maintenance applications that cover roadside service to fuel/energy management and asset tracking. Many of these systems were custom developed over the decades by large carriers. Good service management packages are commercially available. Software and services are available in several flavors. Shippers need to understand not only the customer’s requirements, but all regulations—from country of origin to the destination. The system should provide all the regulatory insights and documents to meet all regulations, as well as input forms. In addition, key information about tariffs/duties, licensing, labeling requirements, as well as denied parties should be included. This data should be available to the financial systems for invoicing, as well as accounting systems to keep track of tax and tariff expenses and payments. Once all the appropriate data is entered, customs filing/reporting should be managed, as should communication with all parties who require the documentation. A GTM solution can also track product creation/assembly as it plays out across the supply chain borders for duty drawback, which can amount to significant savings in some markets. Carbon footprints, emissions, insurance, licensing, and maintenance data all are of interest—and not only for carriers to more effectively and safely manage their assets. Customers are often looking for that data, since they are also expected to comply with extremely high standards. Sustainability goals are part of many retailer and manufacturing programs, and they expect their carriers to participate. Regulations have just been enacted in the US on driver hours, which the trucking industry declares is their biggest issue right now.5 The truck driver’s profession is listed as one of the most dangerous jobs, with regular accidents and fatalities. So labor management software should support driver management, from scheduling and performance assurance (are they on the job and doing their best) to ensuring their safety. Solutions today have cloud and mobile interfaces for tracking and communicating with drivers. We use the term shipper to mean the entity that will determine and manage logistics plans. Carrier selection can be a more long-term decision (selection and contracting) or a carrier may be used to tender just one load. Even for one load, the process can be complex. In addition, today’s shippers have the opportunity to determine the right mode for moving their freight—air vs. ocean, rail vs. truck, or some combination thereof. Often the carriers have their own preferred lanes, so although it might appear like a straightforward deal, carriers will not bid on your freight. This issue is offset by negotiating larger deals so that the carrier can either offset less profitable lanes with more profitable ones or partner with another carrier to move your freight that additional leg in the journey. Even organizations with private fleets—shippers or trucking companies—often have to use ‘for-hire’ carriers to augment their logistics. Many companies use freight forwarders for international logistics, as those organizations often pre-contract with ocean carriers to secure favorable rates. Their knowledge of their market plus pre-securing capacity is essential during peak seasons or during economic upturns. In the last few years, many shippers have contracted with carriers directly due to lower demand/higher availability of international capacity. Longer term carrier selection will have bidding, RFP/RFQ, contracting elements vs. one-off load tendering. Process for securing a specific carrier for a shipment. Load tendering assigns pricing (tender) to the specific shipment (load). Often, a shipper’s transportation software can search various carrier or load board sites to find appropriate lane/capacity availability. A system should execute the appropriate agreed to messaging between entities. For air, ocean, rail and LTL,7 the shipper generally needs to conform to/negotiate on pre-existing schedules and routes. With truckload, where the shipper is reserving the entire ship or truck, the shipper can dictate the schedule. These time windows are integrated/coordinated with the shipper’s warehouse/dock or yard management software and customers’ systems to ensure seamless processes. System should execute the appropriate agreed to messaging between entities (860, 856s, etc.). From the shippers’ perspective, they want to ensure that the delivery process meets all the requirements. Timely scan data at each handoff is a minimum requirement. Today, many shippers also require track and trace/condition monitoring of their freight. Perishable, fragile, or other types of vulnerable products may require RFID, sensors, and GPS tracking technology to support real-time visibility. The visibility systems, therefore, should support the monitoring requirements. Messaging is a constant part of supply chain communications, and will either be embedded in the transportation solution or should be purchased as a compliment to the transportation software. There are EDI providers who focus on the supply chain and logistics sector. From a trading partner/multi-party perspective, ensuring safe freight and on-time compliance is crucial. Many industries and governments require trace data for product quality and/or customs compliance. These are cloud systems with multi-party subscribers: access to ‘participate’ in the process is granted by the shipper. Various solutions exist for this, most notably emanating from the RFID market, which is well positioned to support the condition-monitoring aspects of track and trace. Some visibility systems do track shipments, but often they do not have condition monitoring. Software and devices specifically designed to ensure that perishable products are managed and protected through the whole logistics process. Temperature sensors, RFID, and other devices may travel with the shipment and record temperature and vibration. And/or the container may have sensors throughout the route to ensure consistent temperature. Some devices are read at the end of the shipment. But today, more companies are looking for real-time monitoring from the cloud. Inherent in all these relationships is the EDI and/or AS2 messaging that pass between players. Users can purchase EDI/MFT solutions separately and request that the transportation software provider execute the messages. Or they can work directly with the transportation software provider to help create the appropriate, compliant messaging required by the parties. Large transportation network providers have a rich portfolio of standards-based messaging for all the big companies—retailers, manufacturers, as well as large logistics companies. The newest entry into the market. Social supply chain is designed for secure P2P communications between stakeholders involved in a specific process— procurement, transportation, execution, etc. Social supply chain can be integrated into existing transportation systems or is offered as a module that links execution data with human dialogue. Communication between mobile and desktop should be seamless. Some carriers have quoted rates and schedules that can be used as a guidepost to shipment costs. But many deals are far more complex. And the total base cost of shipping may have many more charges—surcharges, extra handling charges, tariffs, taxes, and insurance. In addition, users often assess various carriers and their rates before deciding. Conversely, price selection, quoting, etc. may be done by a third-party broker or freight forwarder who is negotiating between the parties (shipper and carrier). So the ultimate price quoted to the shipper may have uplift added on to the carrier’s rate to accommodate the intermediary’s fees. The cloud has reduced the mysteries of the transportation industry by allowing ocean, air, truck, and rail to post schedules and other data pertaining to their ability to move freight. However, integrating with various carriers is not child’s play. Of particular value is the load board. These organizations post information from shippers who are looking for a carrier, as well as carriers looking for customers. These organizations manage massive input feeds from a variety of carriers to ensure a current and rich selection of information. They have done more to standardize their information so that TMS systems can integrate and leverage it for carrier selection and load tendering. There are several systems that collect multi-carrier schedules as well as sailing information. Most of these systems provide batch feeds to TMS systems to allow planning for shipments. Referential data on regulations and guidance. Governments provide this information, as well, at the GTM system. These systems provide data about carriers. Carrier information spans marketing information about the carrier and their services to credentialed data—safety record, insurance, etc. These systems do not transact, but are expected to be up to date. Some of these systems are extremely contentious in the market due to the posting of information that might limit a carrier’s marketability (i.e. poor report). Systems that work in remote situations and support in-motion transportation. Older-generation systems provide maps that the carriers can overlay with their specific routes. State-of-the art in this industry now includes real-time spatial, situationally aware capabilities that include current conditions—traffic, weather, and other events that impact transportation. Overlay on geospatial to track the specific truck, ship, etc. ; and for trucking, provide tracking and instructions to the driver (turn-by-turn for example). Mobile applications to communicate with drivers and personnel. These systems can also connect to business systems for processes such as item scanning, payment systems, etc. Rules-based analysis. Analyzes multiple real-time streams to create alerts for optimization and risk reduction. Of course, some tech providers have many of these modules rolled up into a service portal, scheduling and load tendering, and trace solutions for a full-blown transportation management system. Firms like Descartes extend their application beyond TMS, for shippers, carriers and distributors, to include a visibility and messaging system (their Global Logistics Network) and then provide last-mile carrier applications. They have a modular approach, often, to provide a solution for their diverse customer base. Or firms like GT Nexus provide modules that compliment strict transportation applications and provide financial trade management. Both Descartes and GT Nexus have been acquisitive and have many modules in their portfolio. So they can provide a ‘configurable solution.’ Conversely, a firm like MercuryGate has their whole solution, from optimization to TMS, all in one platform. Other transportation software firms specialized in one or two aspects of transportation. For example, Airclic and Cheetah focus on last mile delivery. There are rating engines, strategic procurements and contract management, or visibility solutions, to name a few options. All these systems need information service data from intermediaries such as load boards that post a large selection of carrier-capacity availability; collect and disseminate transportation schedules from air, rail, or ocean carriers; or post inter-enterprise messaging, carrier data, or compliance import/export data. These are yet another segment of the transportation market. When you Google transportation systems, a confusing array of selections comes up: inventory management, GPS hardware, 3PL, and yes, some software. Buyers often are bemused by these search results. In addition, buyers are different and their needs are different. (Socrates is still highly relevant!10 ) Small firms—brokers, freight forwarders, or owner/operator trucking firms—tend to buy components, as they often believe that they will save money by buying one module at a time. But in the last few years, a few of the cloud TMS, notably MercuryGate, have worked to put more components together in cohesive offerings that these smaller firms can use. Traditional TMS providers, such as Logility and JDA, who were mostly on-premise, are providing cloud offerings today. End-users/shippers often buy components for load tendering, messaging, and visibility, since they often rely on contract carriers, or their 3PL, freight forwarder, or broker to do the heavy TMS lifting for them. However, of late, we have seen a different trend: Some firms feel they can get much better control of their freight costs by taking the work inside. And this leads them to seek out a full-blown TMS. This trend is not just for the largest shippers. We have talked to many firms in the mid-market who have insourced the transportation function. If you are a carrier, you need to control every aspect of the ‘move’ process, as well as your equipment, your drivers, your fuel costs, and more. Shippers and carriers have very unique needs, yet they do have some needs in common. So, many of the transportation software systems have catered to both the common and the unique needs of the industry. In order to understand how systems support processes and provide information, it is critical to understand timing. In our quest to gain control of our freight to ensure its safety and compliance, and to truly understand costs, it is critical to understand how systems are architected and how they integrate. The quest for real-time and accurate data has been supported, somewhat, by improvements in the platform. So we need to look at systems’ architectures, not only according to cloud or on premise, but by their method of transaction management and/or responsiveness. We don’t always need real-time, but we do need accurate and current information. Batch—much maligned these days is the term batch processing. Batch processing is an efficient method for storing and then forwarding messages or transactions to support a business schedule, such as monthly bill payment or daily proceeds. Examples here may be messaging systems. When shipping many orders from the warehouse, all the ASNs can be batched and launched at once. Or the export and compliance documents can all be batched and sent at once. Payment systems, as well, can be batched and sent. Why does batch still have relevancy? First, it supports people’s work activities and schedules. People want to ‘settle-up’ and close out a grouping of work. It also is a handy method of segmenting processing so the activities that need to fast track through the systems are not slowed down.11 The less time-sensitive transactions, then, can be batched. In this environment, we are looking at time-critical activities that have a need for high throughput, as well as unexpected patterns which need to be evaluated. Contrast ocean container tracking where daily or hourly updates are sufficient with air traffic control, where every second might count. In track and trace applications, we also want to understand sudden changes in factors such as temperature, diversion, etc. Vehicle telematics turn-by-turn is another example of a continuous system. We want the systems to ‘know’ at all times where we are, the conditions under which we are operating, and tell us the next correct/optimal move we should make. Responsive Systems—you don’t often see this term, but it is important in the transportation industry. These systems ‘wake up’ when a change of state occurs. An ordering system is an example. It can be almost dormant (of course we hope it is not), until an activity is requested of it. Then we want responsiveness, i.e., immediacy while we are transacting, say, in scheduling/confirming/agreeing to a shipment pick-up, but we don’t need the system flashing at us every three seconds thereafter. Information services such as a load boards are another such example. We want them to be current and always accurate, of course; but they don’t have to be continuously flashing. Driver or delivery mobile is another example of a responsive system: specific communication actions such as scanning a proof-of-delivery or referencing instructions from the scheduling and routing systems are examples. Now why is all this important? 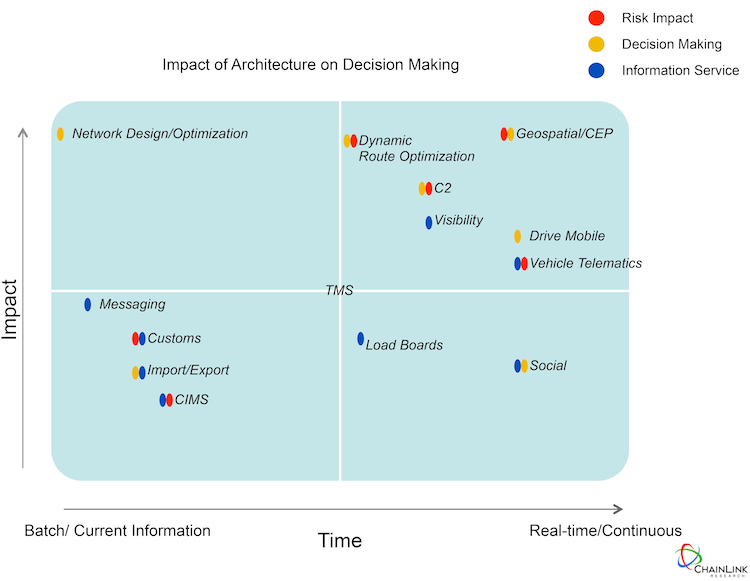 Because it helps you to understand the variety of systems, what you can expect from them, and the impact they have on your business activities and decision making (Figure 2). As we mentioned earlier, users can purchase whole systems or modules, applications, or whole platforms that serve as a foundation for all the modules to work together.16 They need to consider how the information will synchronize to provide visibility. This visibility thing is a huge issue in the industry—it’s being barked about incessantly, but is not often being achieved. Although challenging, buyers need to examine how their internal logistics operations work in harmony with each other, how they synchronize with the transportation services, and how the various services work—or do not work—in harmony with each other. You, the buyer, need to get answers from service providers. And you service providers need demonstrable answers from your technology. Due to a lack of harmony amongst companies in spite of standards, and in spite of total landed cost calculators, we still are challenged when it comes to getting a handle on and predicting the actual freight costs and tracking in-motion freight. In frustration, users turn to visibility or control tower applications that sit on top of operations systems. These systems have a seemingly simple job. Get the order information, and then just monitor the process. Platform content—when selecting a system, close attention must be paid to the modules (Figure 1) and how they integrate with the various information services required to visualize and plan transportation and provide an accurate and appropriately timed view of the freight in motion. Comparing different strategies in collaboration—communities, social supply chain, etc. EDI 853 - Routing and Carrier Instruction/Routing Guide. Routing instructions for shipper/carrier origin and destination. Routing information includes designation of carrier(s) involved, actual route of carrier, and estimated time en route. (2) Right of shipper to determine carriers, routes, and points for transfer of shipments. Often, shipper’s instructions have requests for consolidation to reduce freight costs and congestion during inbound receiving. 4 These modules are often sold as standalone software or services. Full-bodied TMS is discussed in the next article.